Home » Blog » Outdoor Winter Toys » Flexible Flyer PT Blaster, a Cool sled for kids! Flexible Flyer PT Blaster, a Cool sled for kids! For those looking to have a blast this winter, look no further than the Flexible Flyer PT Blaster. This advanced sled allows you to have fun, all while staying in control and being safe. See unlike other sleds, the PT Blaster is equipped with a full, working steering wheel. So instead of going wherever the snow wants you to, with the PT Blaster, you can go where YOU want to go! I myself have had many sleds in my life, and several of them have had steering wheels. However, until I got the PT Blaster, I had never had a sled that actually turned quickly and safely. The wheel is attached to a ski-like piece that turns to the direction you want to go as you turn the wheel. There are no rough or overly rapid turns, and avoiding obstacles is a breeze with the Flexible Flyer PT Blaster. If you're a thrill seeker, you will be happy to learn that the PT Blaster is incredibly fast. The slick design allows for rapid acceleration, and the advanced steering system ensures that your ride is not cut short by obstacles. Plus, since the sled is easy to steer, you shouldn’t have a problem hitting those jumps! If you’re worried about safety, take comfort in the fact that the PT Blaster is one of the safest sleds available today. While it CAN go fast and be used for dangerous activities, it can also be slowed fairly rapidly by its built-in brake. That’s right – unlike most sleds, the PT Blaster has a working brake. Powered by springs, the brake works very well to slow you down, but usually won’t bring you to a complete stop, unless the hill is not too steep. 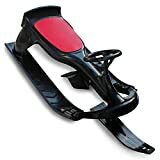 Regardless, this is one of the safest sleds available today, and it has consistently been reviewed positively by customers from around the world. While many sleds are made out of cheap plastic that breaks after just a few hours of use, the PT Blaster is made from extremely durable, thick plastic. Though it is small, it can support quite a bit of weight, and it will not break easily. And since it’s made out of plastic, it’s still lightweight and quick. The sled is even strong enough to resist breaking when it makes contact with trees, fences, and other obstacles – though you should be able to avoid these things with the highly responsive steering system! The only real complaint I have heard about the PT Blaster is that it’s hard to assemble. It comes in pieces, and many consumers say that they had difficulty putting it together. However, most of these complaints were counterbalanced by the fact that this sled is built to last, so once you do have it together, it should work perfectly for years to come. Overall, this is by far one of the best sleds on the market, so if you’re willing to spend a few extra bucks, the PT Blaster by Flexible Flyer is highly recommended. Affiliate links & images from the Amazon Product Advertising API.